Garbage Pail Kids Flashback 2 Orders Due! Topps' upcoming Garbage Pail Kids Flashback Series 2 set is scheduled to arrive in late February, but our orders are already due! Place your order now and receive our best prices. On Tuesday, November 30, we will be raising our box price from $41 to $42 and our case price from $309 to $317. There are 8 boxes per case. 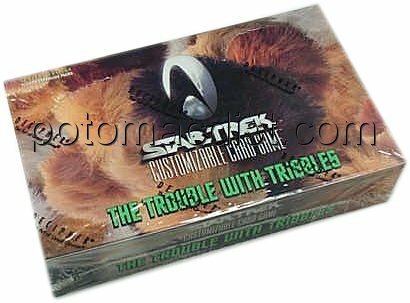 Collectors can look for 5 new never-before published Lost GPKs, 3-D cards, Where Are They Now? Cards, Adam Mania Sticker Variations, Original Sketch Card 1/1 hand drawings by GPK artists, 1/1 Printing Plates (4 variations per sticker), and Parallel Cards (1 per pack/multiple rarity levels). There are 80 stickers in the base set. 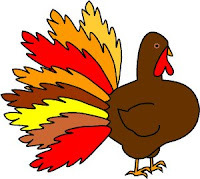 We will be closed for the holiday on Thursday and Friday. Please note that all orders placed between Wednesday evening and Sunday, November 28, will be shipped on Monday, November 29. Harry Potter & the Deathly Hallows Update! Artbox Entertainment forwarded us the final checklist for its upcoming Harry Potter and the Deathly Hallows Part 1 trading card set today. The costume and autograph cards remain the same, but we have details now for the 12 Prop cards and the 25-case incentive. P1 Daily Prophet - "Dark Mark Sparks Panic"
P9 Daily Prophet - "New Headmaster"
P11 Rita Skeeter's Book: "The Life & Lies of Albus Dumbledore"
The 25-case incentive will be Coins from Gringotts! To see the entire checklist, click here. This set is expected to release on December 7th. Warlord City of Gold Arriving Monday! The first two Warlord 4th Edition City of Gold Adventure Path Sets are expected to arrive (finally!) on Monday. You can purchase the Sleeper set or the Storm Awakens set individually for $13 or together for just $23. Of course, we also have all of the other Warlord 4th Edition sets in stock including the Base Set, Shattered Empires, Crimson Coast, Sands of Oblivion, Treasure Chest, and Learn to Play packs. 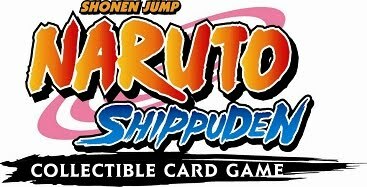 Naruto Tournament Pack 2 Orders Due! Naruto Tournament Pack 2 Boosters are expected to ship on December 10th! Order before Tuesday, November 23rd, to receive our lowest prices. On Tuesday, we plan to raise our Tournament Pack 2 Booster Box price from $58 to $59 per box. Booster cases (6 boxes) will increase from $342 to $348. Each pack includes 10 cards: 1 holographic foil card, 1 rainbow-stamped rare cards, 2 uncommon cards, and 6 common cards. Super-rare gold-holographic foil insert cards are found 1:6 packs on average. Tournament Pack 2 is specially made to assist with draft and sealed events for Naruto players. There are 64 cards in the set, including 30 new Chibi Ninja cards and reprints of the 34 cards that were introduced in the first Tournament Packs. Star Wars Galaxy 6 Coming Soon! Topps has just released the first details surrounding its Star Wars Galaxy Series 6 trading card set, which is currently scheduled to release in late February. We expect to begin taking pre-orders for this set very soon. Click here and enter your email address if you would like to be notified when the set goes on sale. Yu-Gi-Oh Starstrike Blast In Stock! Older Yu-Gi-Oh Restocks Arrive! 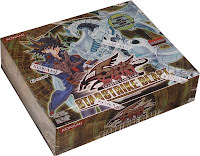 Every Yu-Gi-Oh release is a highly anticipated event, and the arrival of the Starstrike Blast expansion was no exception. We now have Starstrike Blast boosters in stock for $63/box. Cases (12 boxes) are $739. All pre-orders were shipped earlier this week. Garbage Pail Kids Flashback 2 On Sale! We just added Topps' upcoming Garbage Pail Kids Flashback Series 2 trading cards to our web site. The new set is expected to arrive in late February. As usual, Topps will be looking for our order long before that (by the end of November! ), so place your order soon to make sure you don't miss out. Boxes are available for $41. Cases (8 boxes) are $309. Rittenhouse informed us today that it has increased the number of autograph and relic cards that it is including in each box of Stargate Universe Season One. Originally Rittenhouse planned to include 2 autographs and 1 relic card, but there will now be 3 autographs and 2 relic cards in every box! We are pre-selling Stargate Universe Season One boxes for $61, cases (12 boxes) for $709, and binder cases (4 binders) for $82. Cryptozoic Entertainment has announced that the next World of Warcraft expansion, Worldbreaker, will not be released this month as expected. It is now expected to ship by December 15th. 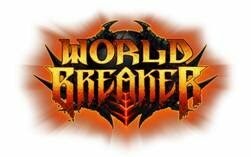 The good news is that the loot cards for Worldbreaker have been confirmed. The rare loot card is the Mottled Drake, a Flying Mount that, with the Cataclysm release, can be used in all old world areas. Grim Campfire, which includes an alternate campfire graphic, is the uncommon. The common is Landro's Lil' XT Action Figure, a permanent in-game pet. We haven't heard whether the delay to the Worldbreaker boosters will affect the Worldbreaker Epic Collection's arrival. It was tentatively scheduled to arrive in mid-December. We are preselling Epic Collection boxes for $27 each or for $309 by the case (12 per case). Each Epic Collection box includes 6 Worldbreaker booster packs, 5 random foil heroes from Worldbreaker, 1 Worldbreaker playmat, 1 Worldbreaker deck box, 1 Worldbreaker visual pocket guide, 1 common loot card, card dividers, and a reusable storage box. Click here to pre-order Worldbreaker boosters or Worldbreaker Epic Collection. Artbox sent us some additional details today for the upcoming Harry Potter and the Deathly Hallows Part 1 trading card set. We now have a nearly complete checklist which you can view below. Artbox also indicated that it is delaying shipment of the set by about a week to allow additional time to get approvals for some of the cards. We now hope to ship pre-orders by December 6th. Click here to order Harry Potter and the Deathly Hallows Part 1. Boxes are $56 each. Cases (10 boxes) are $549. Binder cases (6 binders) are $105. 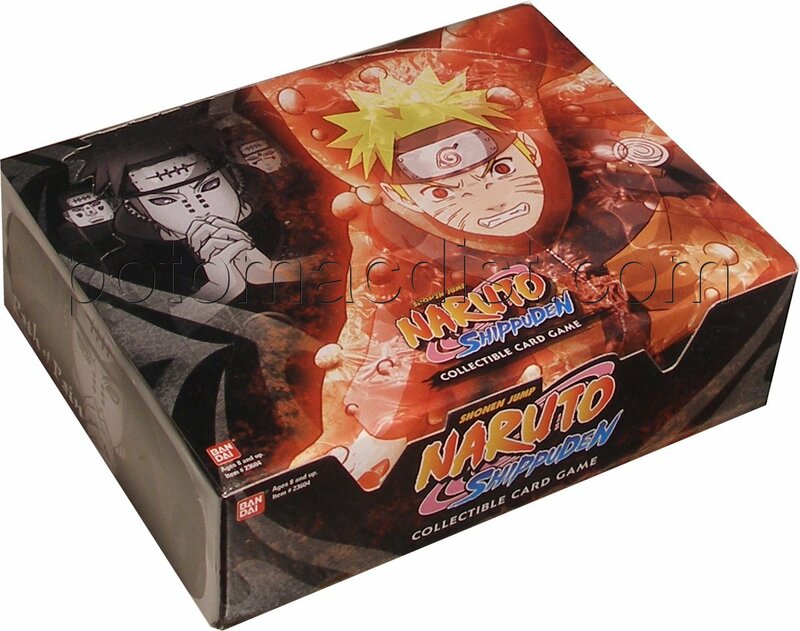 Naruto Path Of Pain In Stock! Naruto Tales Of Gallant Sage On Sale! Naruto Path of Pain is in stock! All pre-orders have been shipped at this point. 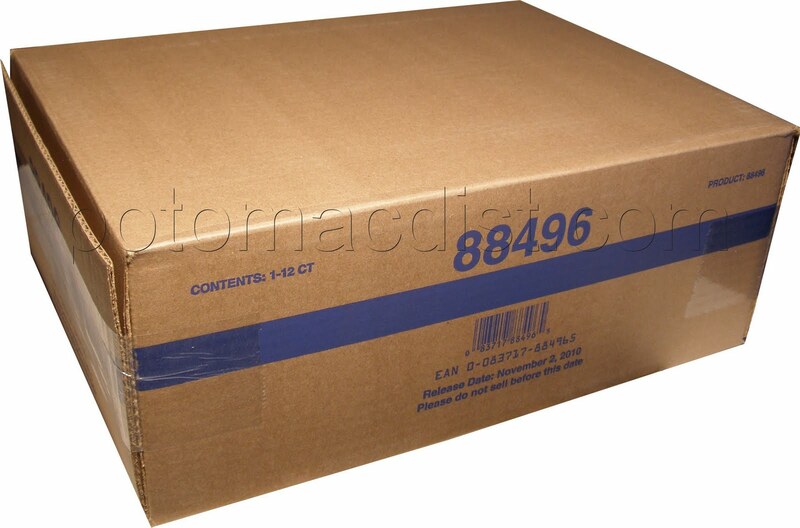 We have booster boxes in stock for $59, booster cases (6 boxes) for $348, and starter boxes for $52. Each pack includes 10 cards - 1 Holographic Foil card, 1 rainbow-stamped rare card, 2 uncommon cards, and 6 common cards. Super-Rare Gold-Holographic Foil Inserts are found 1:6 packs on average. On the heels of the Path of Pain release, Bandai has announced the details surrounding the next Naruto expansion, Tales of Gallant Sage. The twentieth Naruto set is expected to ship on February 4th. The set introduces over 100 new cards to the game and chronicles the Tales of the Gallant Sage (Jiraiya). Booster packs include 10 cards (1 Holographic Foil, 1 Rainbow-Stamped Rare, 2 Uncommon, and 6 Common cards). Super-Rare Gold-Holographic Foil Inserts are found 1:6 packs on average. Booster boxes can be pre-ordered now for $58. Six-box booster cases are $342. Yu-Gi-Oh Yusei 3 On Sale Now! Konami has announced plans to release Yu-Gi-Oh Yusei 3 Duelist Pack Boosters in January! Each Yusei 3 Duelist Booster Pack will include 5 game cards plus 1 strategy card. There are 30 cards in the set, including 8 brand new, powerful cards (4 new Monsters, 2 new Spells, and 2 new Traps), plus 22 of Yusei's favorites. The set consists of 17 common cards, 7 rare cards, 4 super rare cards, 2 ultra rare cards, plus 10 strategy cards. Booster boxes are on sale for $44. Booster cases (12 boxes) are $516. 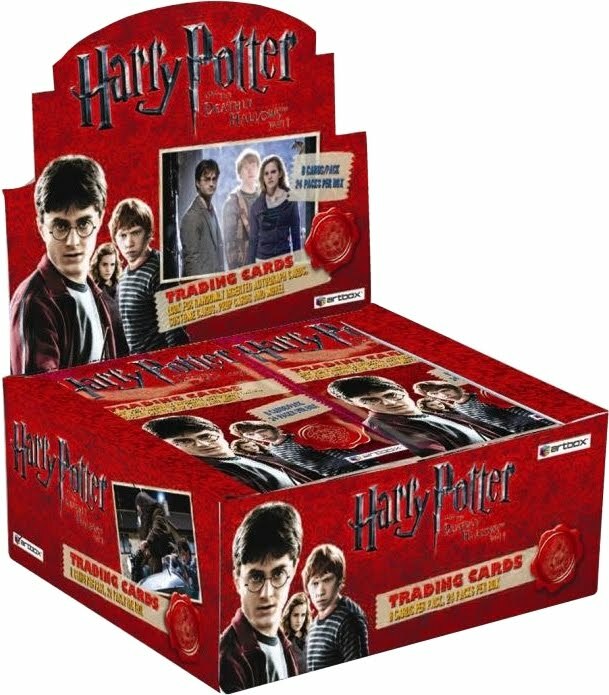 Artbox Entertainment's Harry Potter and the Deathly Hallows Part 1 trading cards are expected to ship on November 24th! Order now to receive our lowest prices! We are planning to raise our prices on Monday (November 8) from $55 to $56 for boxes and $539 to $549 for cases (10 boxes). Binder cases (6 binders) are also available for $105. The Harry Potter and the Deathly Hallows Part 1 set includes autographs (5 per case), prop cards (3 per case), costume cards (10 per case), and Film-Cell cards (3 per case). Autographs includes Rupert Grint, Clemence Poesy, Helen McCrory, Rhys Ifans, Bonnie Wright, Rade Serbedzja, Nick Moran, David O'Hara, Simon McBurney, Andy Linden, and more! Collectors can look for prop cards featuring Daniel Radcliffe, Evanna Lynch, Daily Prophets, Wands, and more. Also randomly inserted are costume cards from Daniel Radcliffe, Emma Watson, Rupert Grint, Evanna Lynch, Alan Rickman, Tom Felton, Mark Williams, and more! There are 90 cards in the base set. If you would like to place an order for Harry Potter and the Deathly Hallows Part 1, click here. Today marks the release of the fourth Pokemon HeartGold & SoulSilver expansion, Triumphant. Pokemon HS Triumphant includes new Pokemon Legends - Darkrai with Cresselia and Palkia with Dialga. The set also includes 8 Pokemon Prime, including Gengar and Machamp, as well as new trainer, supporter, stadium, and holographic parallel cards. There are more than 100 cards in the set. Starters feature two decks built around Mamoswine (Verdant Frost) and Nidoking (Royal Guard). 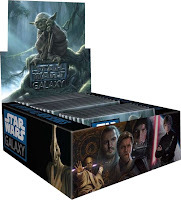 Each deck contains a bonus booster pack and a deck box for storage. 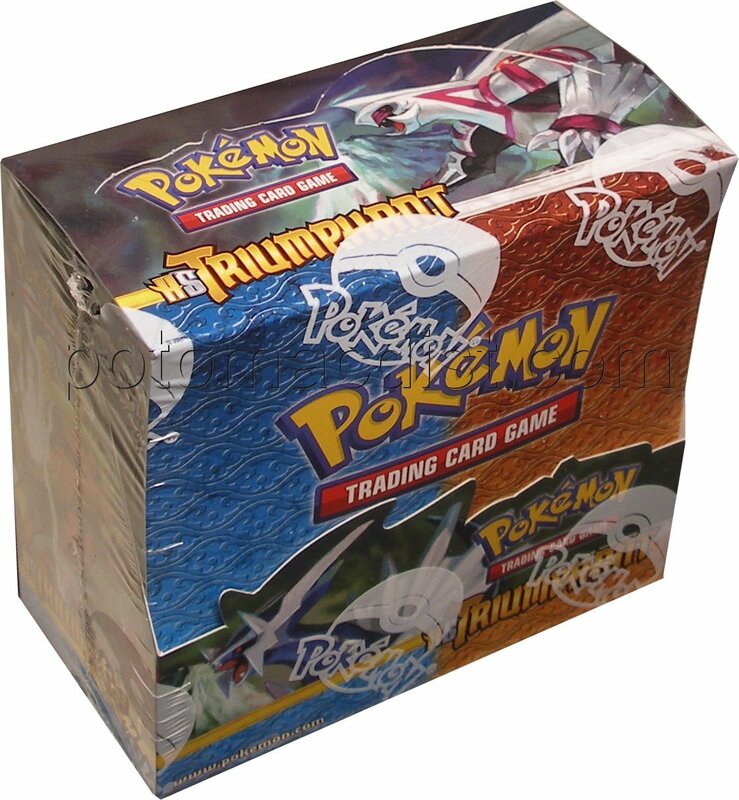 Triumphant booster boxes are $87, booster cases (6 boxes) are $512, and starter boxes are $68. Yu-Gi-Oh Series 2 Tins In Stock! Yu-Gi-Oh Series 2 Tins have arrived! We have a limited number of cases available for $176 each. Cases contain 12 tins. 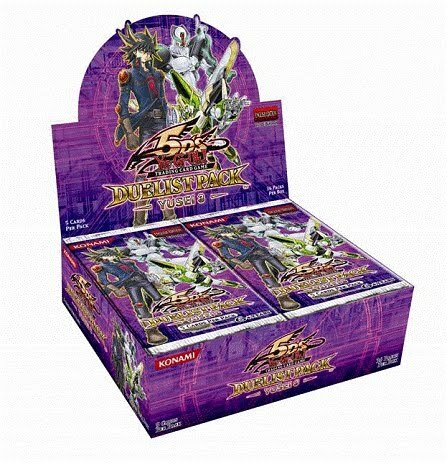 Each tin includes 5 booster packs (1 Hidden Arsenal or Stardust Overdrive pack, 1 Absolute Powerforce pack, 2 Shining Darkness packs, and 1 Duelist Revolution pack) and 5 different variant cards (1 pack of Super Rare cards with 3 Shonen Jump Variant cards and 1 bonus card as well as 1 Secret Rare card).